Embedded videos slowing down your site? You don’t want to frustrate your visitors or drop in the search engine rankings. Load your pages faster with the Lazy Load for Videos WordPress plugin. Find out how it works to speed up your site in our Lazy Load for Videos review. You know that videos are a powerful tool: they allow you to reach a whole new audience with your WordPress site, and are highly engaging for your audience. But embedding videos on your website can sometimes hurt the user experience. Have you had to deal with drops in page speed, losing search engine rankings, or visitors complaining about the slow loading times on your site? Then you probably need a plugin like Lazy Load for Videos. Instead of loading your videos along with the rest of your page content, Lazy Load for Videos replaces embedded Youtube and Vimeo videos with a clickable preview image. To load and play the video, visitors can just click the thumbnail. This saves a tremendous amount of resources by loading videos only if and when your visitors start to watch them. Get started by installing and activating the free plugin. If you’ve already previously published posts or pages with embedded videos, you’ll need to edit and update those pages in order for the plugin to take effect. You don’t actually need to make any changes to the post; just open the edit screen and click the Update button. Then check the post to make sure a thumbnail is loading instead of the video. To make sure your embedded videos on new posts are lazy loaded, just paste the URL of the YouTube or Vimeo video directly into the visual editor. Don’t use YouTube’s embed feature — Lazy Load for Videos doesn’t support YouTube iframes. 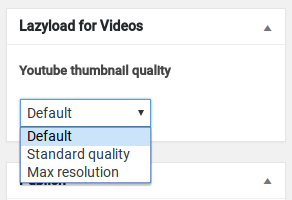 You’ll see there’s a new set of options for your videos on the right, where you can choose the thumbnail quality. For more advanced options, you can navigate to Settings » Lazy Load for Videos. Here there are options for changing the play button color, thumbnail size, and adding your own custom CSS. You can also add schema markup and support for TablePress. Basic documentation is available on the WordPress.org plugin page. It will help you to install the plugin properly and troubleshoot and solve the most common issues. Unfortunately the Lazy Load for Videos plugin is no longer under active development, but the project has community support and is still contributed to by the community on GitHub. If you come across any issues, you can post in the support forums on WordPress.org, where the community may be able to help. Also, videos that are set on “Privacy Mode” on Vimeo won’t be supported, because it’s impossible to access thumbnails for those videos through the Vimeo API. If you embed a lot of videos on your site, your page loading times may suffer. It’s important to keep your pages loading fast, because a slow site can frustrate your visitors and cause your search engine rankings to drop. We recommend using Lazy Load for Videos if you want to prevent videos from loading until your visitors are ready to watch them. Though the plugin is now unsupported by the developer, it’s simple and easy to use, and the community support may be able to help you with any issues that might arise.